We offer an extensive range of feeders designed specifically for the care and management of horses. We have consulted with veterinary experts and breeders to produce tough and durable products that are capable of withstanding aggressive horse play while also insuring horse safety. A safe and effective means of providing creep feed to foals in the presence of the mare or other grazing animals. This labour saving device reduces the level of management and supervision required during feeding. 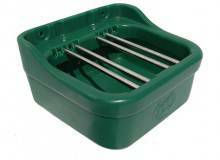 The JFC Foal Feeder is extremely durable and finished with a smooth, seamless finish for ease of cleaning. 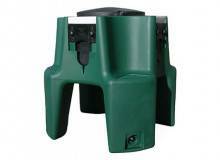 Designed with innovate features to prevent feed spillage and waste.